The shrimp boats and a few sail boats were docked for the day along Shem Creek, a long time fishing center turned tourist attraction when the board walk was added. The smaller inlet off the creek winds around the marsh and frequently hosts egrets, herons and other water birds. 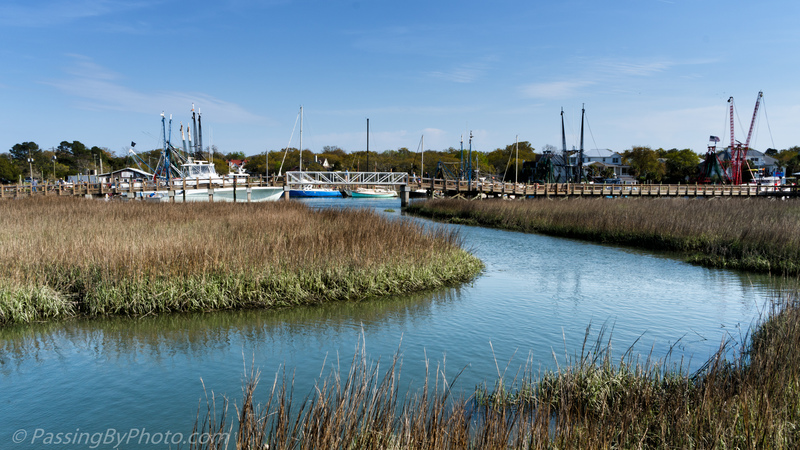 Shem Creek – click image for larger viewTaken with my new 20mm lens, 3/24/2018. Such a beautiful scene and very nicely composed. Love your photo Ellen! Thank you, Liz. This is another one of those places that over development is on it way to spoiling, a victim of its own success.